Copy and paste the HTML below to embed this audio onto your web page. Find out more here. In the days before ballpoint pens were free giveaways for every bank and pharmaceutical company, Phil Wiederlight and his father, Al, were pen surgeons. They toiled in their Fountain Pen Hospital, est. 1946, using an assortment of specialty instruments like long, thin "alligator tools" to repair broken ink sacs and nibs. The advent of cheap and disposable ballpoint and rollerball pens forced the Wiederlights to evolve with the times. In the 1970s, with Phil's two sons, Terry and Steve, they started selling office supplies in addition to fountain pens. Then, in the late ‘80s, the Wiederlights were hit with a changing American economy once again. "I saw Staples coming in and I said, 'Now it's time to go back to our roots,'" co-owner Terry Wiederlight recalled. 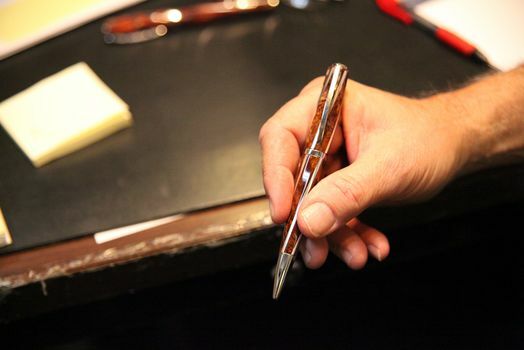 The youngest generation of Wiederlights spearheaded a return to the original niche, and the Fountain Pen Hospital now only sells writing instruments and their accessories. More fountain pens fly off the shelves than ballpoints and rollerballs combined. These once utilitarian tools are now considered luxury accessories that embody a high degree of class. "It's something that makes a statement. When you go to court or anyplace else, if somebody takes out a Bic, it means one thing. If somebody takes out a fine instrument, you look at that guy a little different," said Peter Frankel, an attorney who has patronized the shop for 40 years, while building a large collection of pens. 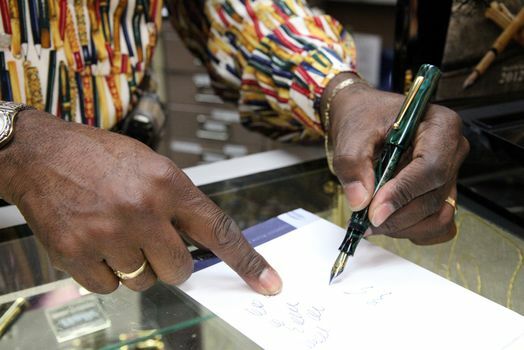 Frankel said he has a multi-generational connection to the Fountain Pen Hospital — in the '60s his father used to bring in wounded pens to be mended. 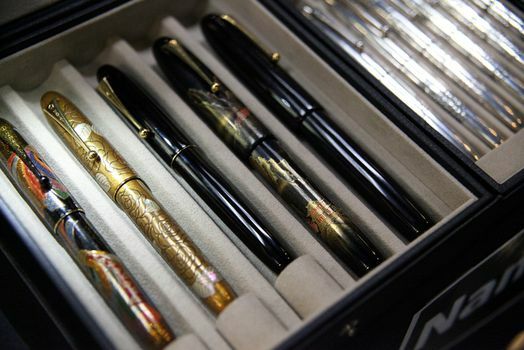 The price of a pen is driven by its materials, which can include a solid gold nib or embedded diamonds. Often manufacturers tantalize customers with limited edition pens that have detailed biographies embedded in their designs. 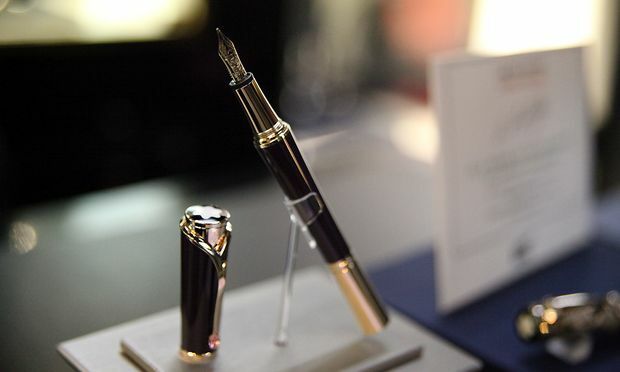 At the spring fair, customers had the chance to gracefully sign their names with Montblanc pens inspired by Princess Grace Kelly of Monaco, and a Visconti pen that reflects the "golden ratio," 1.618. "I could have chosen a cheap hobby but I chose this," said Jocelyn Berger-Barrera, who shelled out $50 for a Harley-Davidson inspired pen to add to her collection. "I have a kindle, I have a netbook, but, when I write, I really love to write with ink pens," she explained. Lou Lunez identified himself as a fountain pen “user” not a “collector.” He’s had the same fountain pen for 30 years, but comes to the shop to pick up inks. "I love the way fountain pens write, the way the ink just flows on the paper and it gives the words extra meaning, extra character, the lines have shading. They have depth. You not only are putting your thoughts down, it's almost like you're bringing them to life," he said, adding he also appreciated that fountain pens are less wasteful than disposables. The pens can be transcendental time machines for some writers. "It makes me feel like I'm stepping into the '30s, I guess, or the '40s. It makes the experience of writing different for me," said Doug Muller, a computer programmer who also uses scented inks (lavender, cinnamon) to add another layer to the writing experience. Luckily for the Wiederlights, the allure of fountain pens is trickling down to a younger generation, like a trio of Stuyvesant High School students who walked the few blocks over after class. Ninth grader Miad Hoque got hooked on collecting the pens in fifth grade. He uses them for “just about anything: homework, class work and notes. I'm always a little paranoid because they're valuable." How have fountain pens changed over the years? It's changed because it's become a luxury item now. People want to go back to writing again, especially today with all the computers and everything. So for the last couple of years it's become an accessory for men, women, both. From all walks. From children all the way up. We sell Mickey Mouse pens for $20-$25 to thousands upon thousands for limited editions. Do you sell much ink? Inks have become a very, very big part of the business. We have inks for $35 a bottle and they sell like M&Ms, it's unbelievable. People love to write with different colors, we have so many different flavors of inks. What's the difference between writing with a pen versus on a computer? It's so much more personal. Getting a letter is so much more personal than email. No doubt about it....A pen is, I think, personally, I think, is a great gift. You're using the item, and the consumer who is getting the item always thinks about you while he's using that item. Not like he gets a gift, a bottle of liquor: he takes it, drinks it, boom, it's over, he doesn't think. But a pen, it's something that they're always going to remember you by, if you want them to remember you. 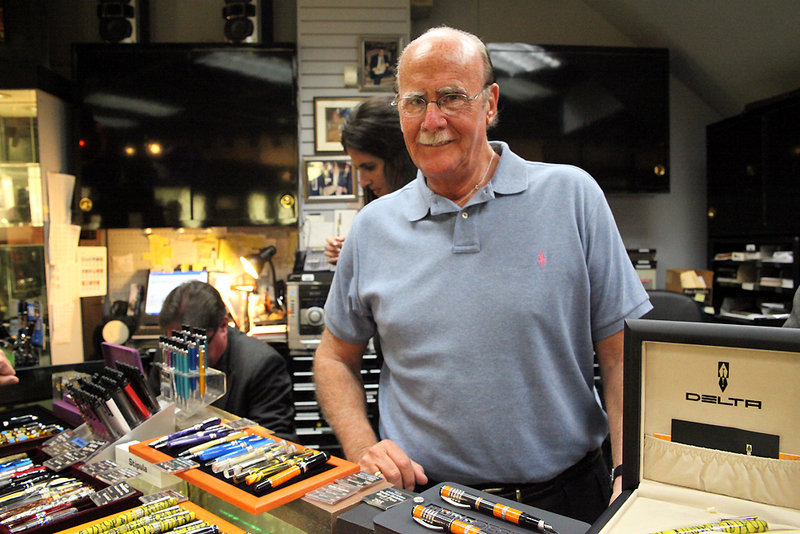 Doug Muller picking out a pen at the Fountain Pen Hospital. 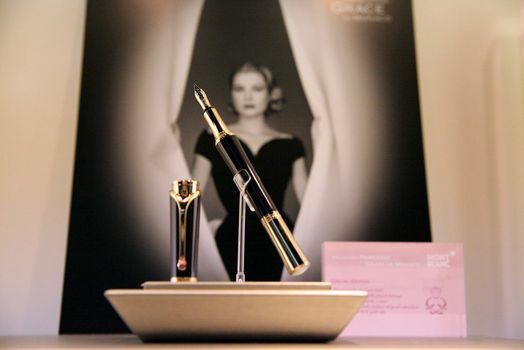 The Montblanc pen inspired by Princess Grace. Students from Stuyvesant High School at the Fountain Pen Hospital. 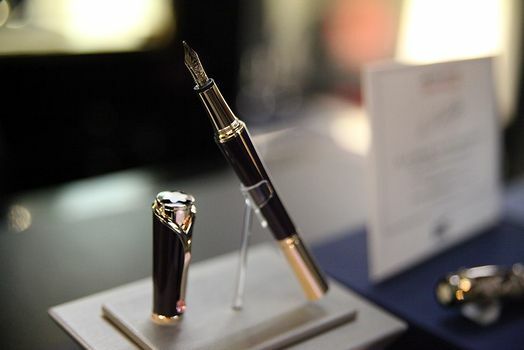 A fountain pen with a gold nib on display at the Fountain Pen Hospital. But I think it was a Shaeffer. Today I crave the Pelikan M1000 in black and green. I prefer the all black pen. This would be my last. I have pens from the 1910 and the Pelikans. in the more than any other pen. Like Pelikan does. I'm one of the far flung customers at the other end of the country who buys off their website. What the article doesn't mention is their lovely customer service, no-nonsense return policy, and ability to find nibs past the F and M boredom the bean counters insist on for many pen companies. Once you've realized that these pens save your hands over hours and days of writing...once you see how beautiful even the worst writing looks flowing off a stub, italic or oblique nib...THAT'S when you're hooked on these pens and never look back! 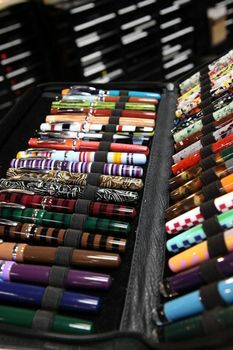 FPH is one of my favorite "pen pushers" in a field where finding the perfect pens is as addictive as crack and far better for you! I used to come to the Fountain Pen Hospital with my father every trip we made into NYC. I have very fond memories here. My father passed almost three years ago and I still treasure his vast collection of Mont Blanc pens and even a highlighter. Register for your own account so you can vote on comments, save your favorites, and more. Learn more. Please stay on topic, be civil, and be brief. WNYC 93.9 FM and AM 820 are New York's flagship public radio stations, broadcasting the finest programs from NPR and Public Radio International, as well as a wide range of award-winning local programming. WNYC is a division of New York Public Radio.